The Cartoon Cave: Happy Birthday, Phil Harris! Phil Harris was one of those larger than life personalities that used to be quite common in the showbiz of yesteryear, but sadly is rather rare today. With his broad features, distinctive warm southern drawl, and a brash, yet affable manner, Phil was a memorable character. Though never really a leading man, he had a pretty good career playing variations of himself in a fair number of films. Mostly, however, he's remembered for two things: First, his radio career, initially as one of Jack Benny's regulars, then later alongside his wife, Alice Faye, in their own radio show. And secondly he's remembered as the warm, rumbly voice of Baloo in Disney's The Jungle Book (1967), followed by roles as Thomas O'Malley the alley cat in The Aristocats (1970), and as another bear, Little John in Robin Hood (1973). 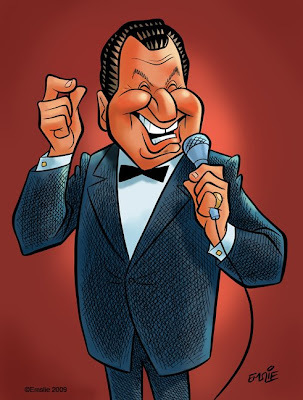 These Disney voiceovers guaranteed Phil a longlasting legacy with successive generations of kids, an audience quite the opposite to the adult crowds he was more used to entertaining on the Las Vegas strip in the hotels and nightclubs of that great era of the 50s and 60s. Though I'll always love him best as Baloo, I'm also rather impressed with his role as O'Malley in The Aristocats. Whereas Baloo was purportedly modeled on that affable oaf, Wallace Beery, the popular character actor from the silent era through the early 1940s, Phil's portrayal of O'Malley has always seemed to me much more like an alley cat version of the 50s/60s breezy Frank Sinatra! O'Malley's a middle-aged Lothario, initially looking for an uncomplicated and noncommittal romance with Duchess, the Persian cat damsel in distress that he encounters in his aimless wandering. This in itself always seemed pretty interesting and different to me, since the average Disney hero was always hellbent on love and marriage with the heroine right from the get go, with the only other exception I can recall being Tramp (who puts me in mind of Gene Kelly, by the way). Additionally, I like the fact that O'Malley is obviously a more mature male, quite a bit older than the usual teenage hero of Disney animated features. This placed him more in the company of the type of actors I always liked best, such as Cary Grant, Gregory Peck, as well as the aforementioned Sinatra. I know the critics have never liked The Aristocats, but it remains a guilty pleasure of mine, mostly due to Phil Harris's vocal performance as the rakish O'Malley. I'm always happy to spread the word on Dino! Entertainers like Dean, Phil Harris and their contemporaries don't seem to exist in today's entertainment industry. Personally I bemoan what constitutes entertainment these days and continue to wax nostalgic for the glories of the past. "The Thing" is one of the greatest songs ever. Period. I heard it first when I was 11, and it's been stuck in my head ever since. And while I'm not really a fan of the later Disney films, I have to say that his performance as Baloo was the crème de la crème of the "lovable, bungling uncle" type character. Phil Harris recorded some great novelty songs, including "The Thing". I love his self-penned southern fried composition, "That's What I Like About the South", as well as a cute little ditty entitled "Goofus". Then there's a very odd song called "The Persian Kitten", that is so similar to the O'Malley and Duchess story it's uncanny, even though it predates The Aristocats by at least 15 years! He was also a big influence on one of my other favourites, country singer Jerry Reed (who sadly passed away just last year from emphysema). Jerry recorded "The Uptown Poker Club" changing the title inexplicably from "The Darktown Poker Club" that Harris made a hit many years earlier. Both singers had a knack for a fast talk/sing approach to their material, flavoured with a wickedly sardonic humour. In the early 1980s, Jerry had a short-lived TV series entitled The Concrete Cowboys, and Phil Harris had a guest role on the pilot show. You could tell in a jamming duet session in the story that Jerry had a genuine fondness for ol' Phil - it was a very sweet scene. For a fitting variety style tribute to Phil Harris. Being a child of the 80's I am not too familiar with some of the great entertainers of yesteryear. In fact (I confess)I only found out who Phil Harris was after the recent dvd release of 'The Jungle Book'. I find it sad that we don't have personalities like his in this day and age, but I can only imagine how you must feel being someone who experienced the excitement of the glory days first hand. Also thank you for the regular caricatures. Keep 'em coming. As a fan of Phil Harris dating back to his appearances on The Jack Benny Show, thanks for that clip of Phil and Scatman that I've never seen before and for the teatime tête-à-tête with Dino which was sheer delight! Sheridan Animation at the Bloor!